Here's a behind-the-scenes look. 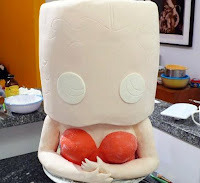 These are the final steps of how the birthday cake for our own beloved "Betty Boop" (from the 2's 3's) came together last year. 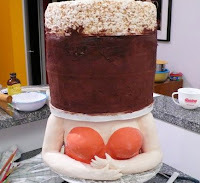 Rice Krispie Treats were molded into an oval tier and placed on top of a 2-tier oval cake. This cake was balanced onto a carved body cake (with strong internal supports built in). Then the whole thing was covered in White Chocolate fondant and then painted with powdered food color. Rice Krispies Treats (see package instructions) are great for making cake decorations and sculptures. omg! that is awesome! wow! I'm still shocked! awesome job! 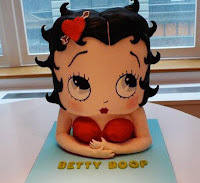 simple awesome... omg...wow..
My best friend loves betty boop and after seeing your cake I would love to make this for her. I love her............. love Betty Boop! that Cake is amazing !! I bet you got a bit nervous when you saw how it was looking on those first couple pictures, lol! But the finished product is the best I have seen, and I have been looking at them all evening!